Nothing says Christmas quite like turkey! Around our house though, we generally do a prime rib for Christmas dinner, so I needed another reason to try smoking a turkey. Well last week the opportunity presented itself when we invited some good friends over for to celebrate the season with us. Jackpot! 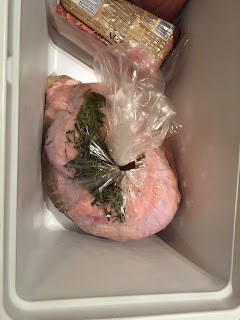 I picked up about a 15 pound fresh bird at Costco on Friday and stored it in a cooler out on our back deck. Saturday night I prepared a brine of salt water, some onion and some fresh herbs. 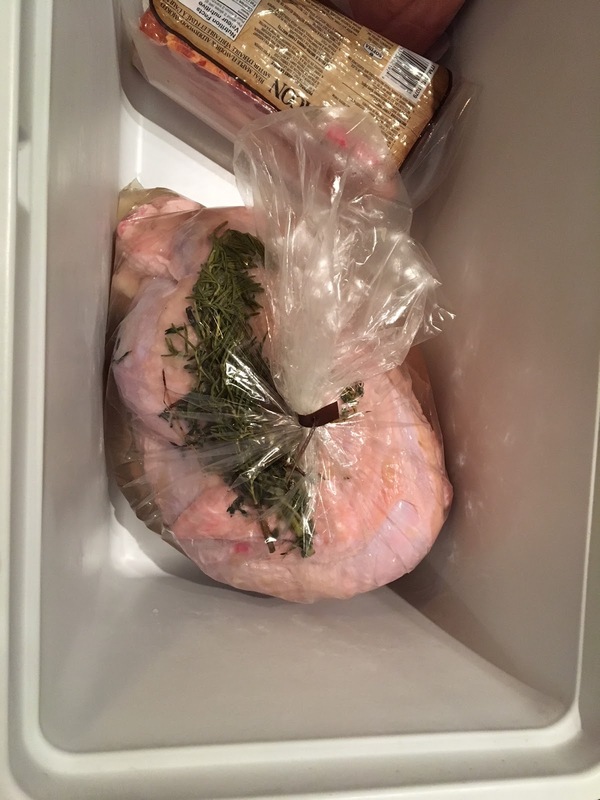 I had picked up a large oven roasting bag and after washing the turkey I placed it in the roasting bag with the cooled brine and it all went back out into the cooler for the night. We woke up to a bit of a windy morning which had me worried about keeping the temperature stable on my Oklahoma Joe Highland, but fortunately the wind calmed down a little by the time I was ready to cook. I got the smoker going shortly past noon with a couple of chimneys of charcoal and then added some oak and apple chunks before putting the turkey on around 1:30. Not to toot my own horn, but I've set the bar pretty high when it comes to cooking turkey! 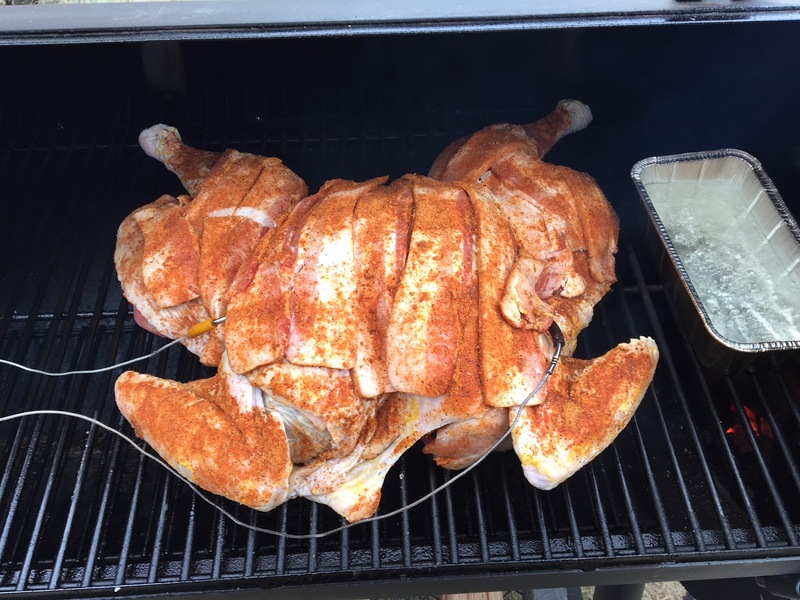 Our friend Keith shared a method for cooking turkey on a propane grill a few years ago and it has become the go to. We start by peeling the skin back off the breast meat and poking some holes in the breast meat with a knife. Fresh garlic cloves get inserted into these holes and then the breast meat gets coated with a thin layer of barbecue sauce and then slices of thick cut bacon are placed over the breast meat. You then pull the skin back into place. We have needed to use toothpicks in the past to hold the skin back in place...just remember how many you use and make sure to get them all out afterwards! 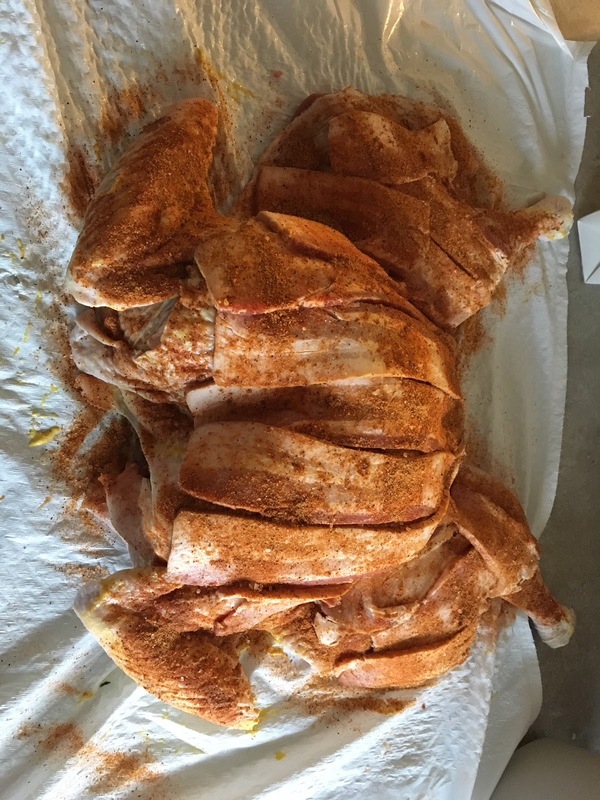 With the skin back, a layer of yellow mustard is spread over the whole bird followed by the rub of your choice and then another layer of bacon. We then place the turkey in a foil roasting pan with some broth or white wine in the bottom and cook it over indirect heat on the grill. For this turkey, I had decided to spatchcock the bird to speed up the cooking process, but I figured there was no reason I couldn't prepare the turkey as usual with the all the bacony goodness! I cut the backbone out, flattened out the bird and went to work. For the rub, I used Cluck & Squeal. I get it at my local Barbecues Galore store and I'm quite fond of it. Seasoned, covered in bacon and ready to go! I had my iGrill2 set for 165 with a probe in each breast. With the turkey underway, I went to work on the appetizer of pork belly burnt ends. I had done these once previously and they were great. I made a big mistake this time when buying the pork belly though and forgot to have the butcher remove the rind. I quickly realized this when I started cubing up the pork belly to season it for cooking. This really added to the time it took to cut up the pork belly and hopefully this isn't a mistake I repeat in the future. We're lucky to have a top notch butcher shop nearby in NW Calgary, Bon Ton Meat Market, and they were happy to remove the rind for me the last time. Lesson learned! 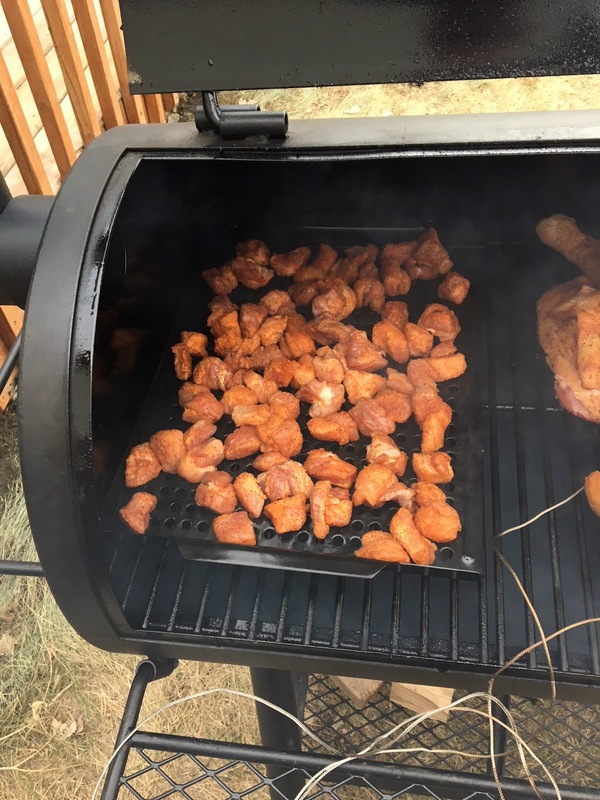 Once I had the pork belly cubed up, I tossed it in some Cluck & Squeal and spread the pieces out on a grill pan and added them to the smoker alongside the turkey. Pork Belly Burnt Ends - Bacon Candy! The wind and the cooler Alberta weather factored in, but I was able to get the smoker holding pretty steady around 250 degrees. I added 4 or 5 chimneys of charcoal throughout the cook, along with plenty of oak splits and apple chunks. We decided kind of last minute to add another appetizer into the mix, some prawns in a butter sauce. I had seen a posting on Instagram earlier in the day that looked great, so when we were at the grocery store before I started cooking we had grabbed what we needed. My wife prepared the prawns in a sauce of butter with some lemon juice and worchestershire sauce and tossed in some rosemary for good measure. Once the pork belly came off the smoker after a couple of hours, I put the prawns on for about 45 minutes to an hour. 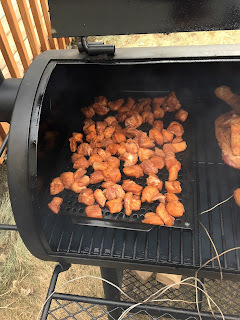 To finish off the burnt ends, I tossed the pork belly cubes in some sauce, put them in a foil pan and put them on the propane grill to get yummy! 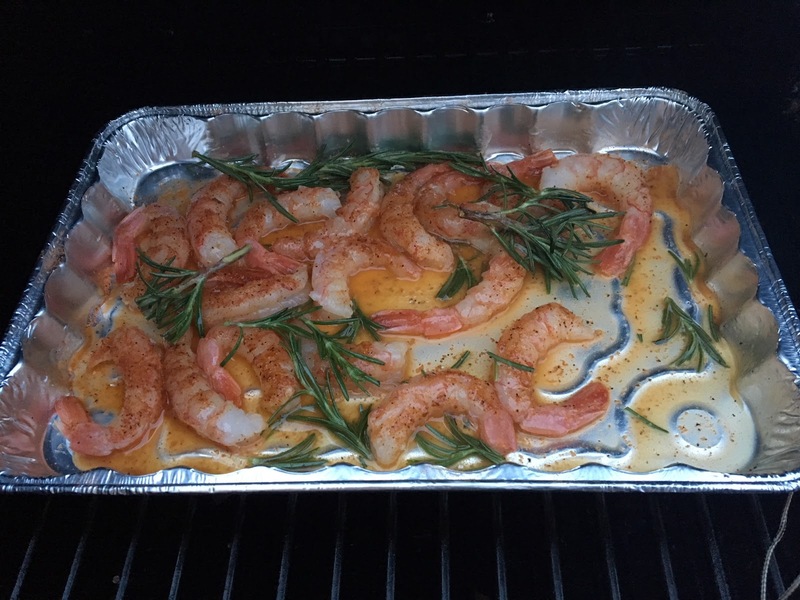 The smoker was full with the turkey and prawns, and I wanted the higher heat from the grill to crisp them up a bit. Everyone enjoyed the burnt ends and prawns while we waited for the main course. To go along with the turkey, we had prepared some mashed potatoes, a cauliflower and broccoli au gratin and corn bread with honey butter. 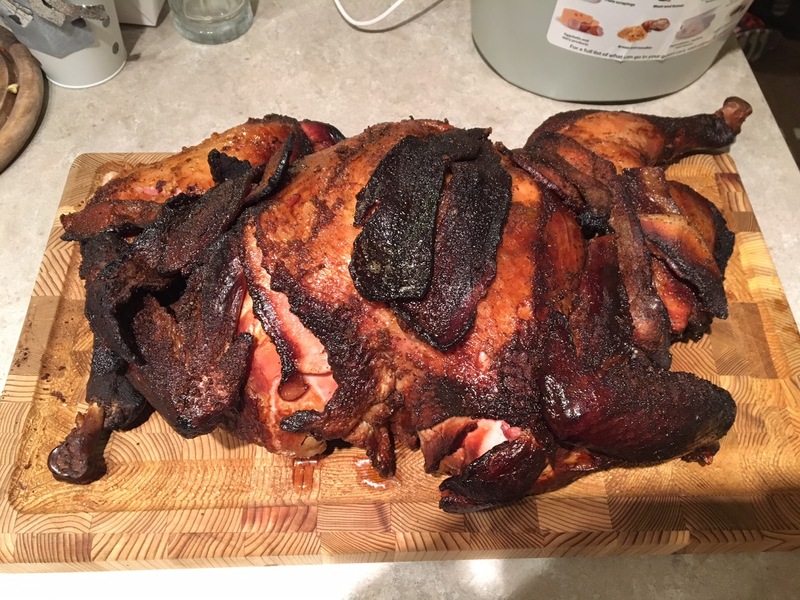 After about 6 hours the bird was ready to come off. I got the turkey carved up and ready to eat, along with that deliciously crispy bacon. The outer layer of bacon gets nice and crispy during the cook, but the inside layer under the turkey skin stays pretty soggy. In the end, the turkey was very good, as were the two appetizers I smoked. With the white breast meat, none of us really noticed any substantial smoke flavour, but I did notice it more on the dark meat. It was a great meal and a good way to kick off the Christmas season with some special friends.